The SSE Riga main building is located in Riga’s renowned Art Nouveau district. 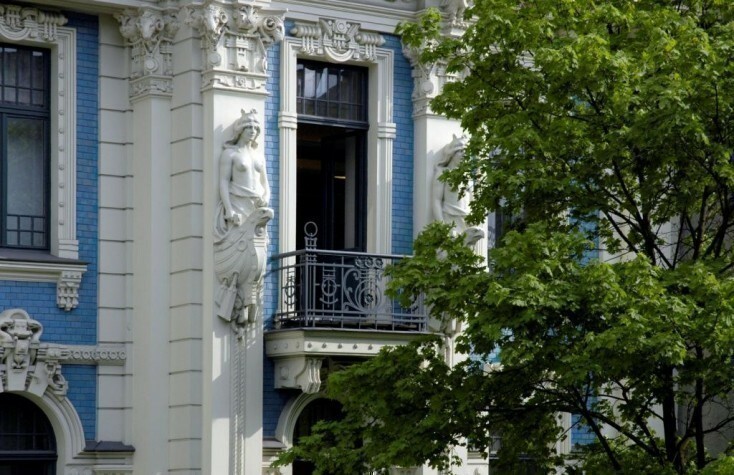 The district is listed as a UNESCO World Heritage due to its “outstanding universal value by virtue of the quality and quantity of its Art Nouveau architecture, which is unparalleled anywhere in the world…”. 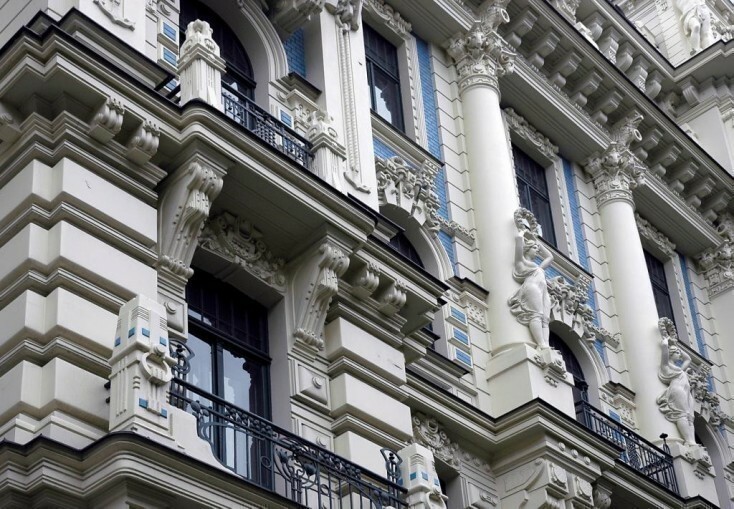 The SSE Riga building with its blue-and-white façade was designed in 1905 by the famous architect Mikhail Eisenstein. Initially this Art Nouveau building with many figurative decorations was designed for the Stepan Mitusov Private School, but from 1993­-1994 it was renovated to accommodate SSE Riga students. 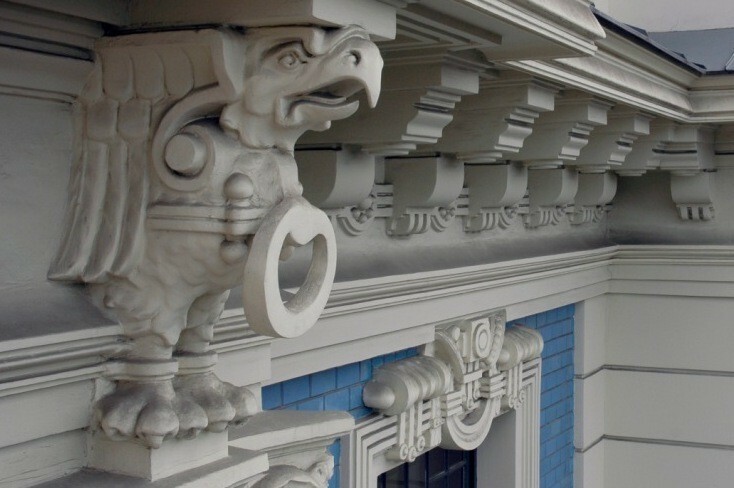 For more than 20 years now SSE Riga students have admired the architect’s imagination on the richly decorated School building with its youthful females, women in Viking boats, Atlas figures, eagles, ram’s heads and even stylized helmeted heads. 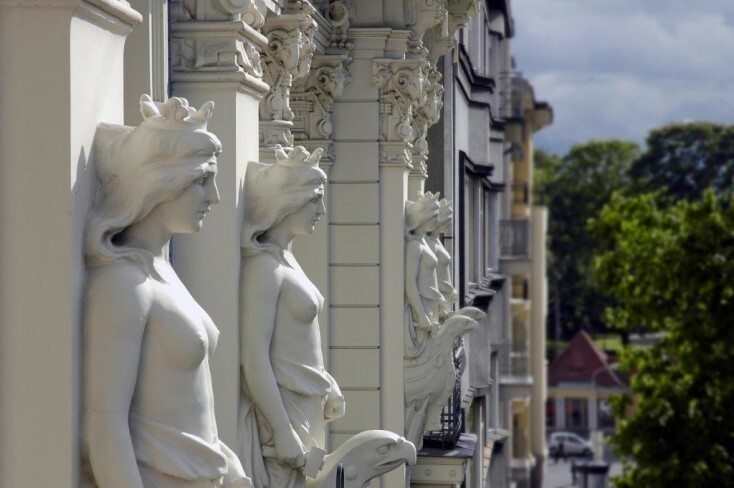 The SSE Riga building is a remarkable structure and an architectural monument of national significance in the heart of Riga’s Art Nouveau district. 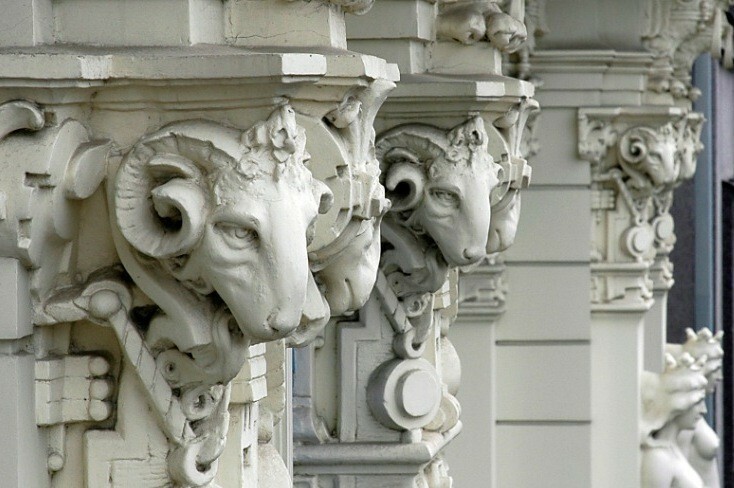 The Art Nouveau style of architecture developed as a reaction against the imitation of historical styles which were considered remnants of the past at the end of the nineteenth century. It introduced a distinctively new artistic expression bearing unusual figurative decoration on the façade of buildings. However, Art Nouveau was much criticised by contemporaries for its highly elaborate nature, and around 1910 national romanticism was back in fashion. Yellow stone with blue accents - It is a symmetrically arranged six-story building of yellow stone, masterfully contrasted with brilliant blue tiles. 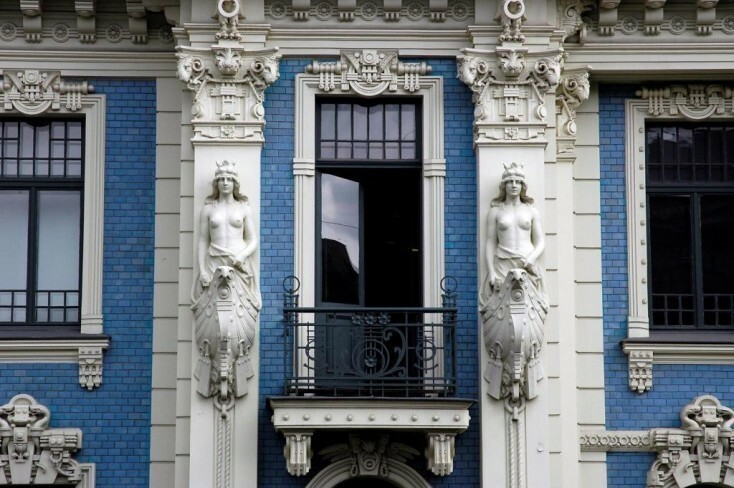 Sculptural decoration - The sculptural decoration is rather understated and consists of highly idealized females placed against the columns. Play of light and shadow - As seen in other works of Eisenstein’s, the stringcourses and deeply riveted stonework accentuate the horizontal orientation and provide a striking play between light and shadow. 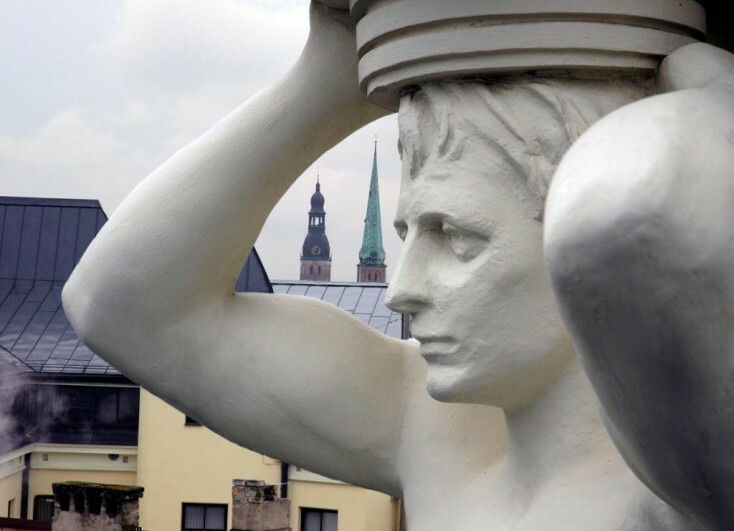 Atlas figures - The tower above the parapet displays atlas figures whose heads and raised arms support the cornice and the roof. Dramatically expressive - Decorations on Eisenstein’s buildings tended to be dramatically expressive, and the School’s building at Strelnieku iela 4a is no exception. Reconstruction work began in 1993 - The reconstruction work included restoring the facade of the building and a number of its rooms to their original condition. Home to many students - Since the building was reopened as a school in 1994, it has not only been the second but also the “first home” to many students, who are coming early in the morning and leaving around midnight. Stepan Mitusov, and administrator from Russia bought the land on Strelnieku iela 4a. The Riga Board of Building Construction approved the Project designed by Michael Eisenstein. Municipal Health-officer Dr. Nagurskis reported to the Sanitary Inspection that the newly built dwelling house was completed and ready for tenants to move in, with the exception of rooms for the school and the basement. The German School for Boys was located in the building. Some parts of the building were used as apartments. The Riga Municipality decided to buy the real estate at Strelnieku iela 4a for 137.000 Ls. The building housed a Germany primary school for boys. An Estonian primary school occupied the ground floor. According to eyewitnesses the building used to house Russian prisoners of war. A Russian grammar school was started in the building. The building housed the State Technical College. The building is used as a student dormitory for the College of Building Construction. The Latvian Cabinet of Ministers approved Mr. Piebalgs’ proposal to the Ministry of Education to establish the Stockholm School of Economics in Riga as a non-profit association and to assign the building at Strelnieku iela 4a for that purpose. Skanska began renovation and rebuilding work. SSE Riga started to use the building. The building was officially inaugurated in the presence of H.M. the King of Sweden Carl XVI Gustaf, and the President of the Republic of Latvia M. Guntis Ulmanis.